What is the advantage of using _Layout.cshtml view? Rather than having all of these sections, in each and every view, we can define them in a layout view and then inherit that look and feel in all the views. With layout views, maintaining the consistent look and feel across all the views becomes much easier, as we have only one layout file to modify, should there be any change. The change will then be immediately reflected across all the views in entire application. Step 1: Create an empty asp.net mvc4 application. Step 2: Right click on "Views" folder and add "Shared" folder. 1. View specific title is retrieved using @ViewBag.Title. 2. View specific content will be plugged-in at the location, where RenderBody() function is called. Step 4: Let us use the following table tblEmployee, and generate a few views that can be used with our layout view. Step 5: Add ADO.NET entity data model based on the above table. Build the solution, so that Employee model class is compiled. Step 6: Add a HomeController, with the following settings, so that Index, Details, Create, Edit and Delete views are auto-generated. Step 7: Now, we need to make modifications to Index.cshtml view, to use _Layout.cshtml layout view. Copy and paste the following code just below, @model declaration. Notice that, we are storing title in ViewBag object. The layout view is going to retrieve it from viewbag and use it as the title. The next statement, specifies the layout file to use. 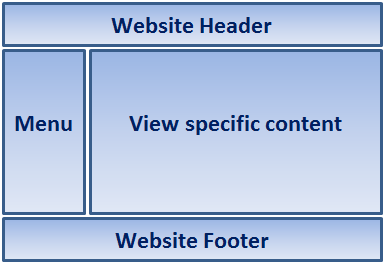 At this point navigate to Index view and notice that, it uses the layout file that we have defined. Save changes and navigate to Index view. Now click on "Edit" link. The page crashes. To fix it, delete "Scripts" section that is at the bottom of the Edit view. Refresh the page. Notice that, we don't have error now, but this view is not using the layout view. To fix it, we need to include the following code, as we did on index view. Congratulation for wonderful video tutorials on MVC. One thing I would like to know, I have a master layout and in navigation div, I want to add dynamic menus. I tried with partial view and RenderAction but using render action it generate Error " Error executing child request for handler HandlerUtilServerExecuteHttpHandler and when execute partial view , controller method does not execute and received null exception in Partial view. Please help, thanks. How to avoid refresh of layout view when navigating between pages. for example in my layout i have left sidebar with links. when i clink on link to create the whole page refresh. how to avoid this, please help.